Capable to handle logs up to a max. Ø of approx. 270 mm Working mechanism and operation system: the standard machine works on a 3-point hitch and a cardan shaft for power take off from the tractor. 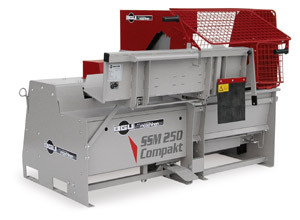 The saw is equipped with a clutch arbor to power the hydraulic system at start-up. The log splitter is controlled with a foot pedal. The cut piece drops onto the log carriage in the splitter and an hydraulic driven push-block forces the log against the wedge and out of the splitting unit while the saw is ready for the next cutting cycle. This combination of two separate sections and simultaneous log advancing/ cutting and splitting assures great time and money savings.